Tree diseases with rust are fungal infections that affect a variety of different types of trees, with damage that ranges from mild to severe. Determine prevalently affected trees, the different types of rust that attack particular varieties and suggested control methods. Keep your trees vigorous for rust prevention and the ability to fight problems that may occur. Many fungal pathogens cause tree diseases with rust and attack different types of trees. Sweetfern rust is a disease caused by the fungus Cronartium comptoniae that kills immature pine trees. Comandra rust, caused by the fungus Cronartium comadrae, primarily attacks pines as well, according to the University of Minnesota Extension. Cedar-apple rust disease is caused by Gymnosporangium juniperi-virginianae and needs two different trees for a complete life cycle; in the spring season, this rust disease infects an apple tree and in the summer, it infects an eastern red cedar, according to the Purdue Extension. Rust diseases are a widespread problem and they often attack varying types of pine trees including, but not limited to, mugo pines, Ponderosa pines, jack pines and white pines, according to the University of Minnesota Extension. Cedar-apple rust, among other cedar rust diseases, affects many types of cedar and apple trees, such as Rocky Mountain junipers, hawthorns, crabapples and pears, according to the Purdue Extension. Tree diseases with rust display similar symptoms from fungi to fungi and tree to tree. Rust often displays cankers or blisters on branches and leaves, branch dieback, malformed plant parts and yellowing or death of leaves. Most significant, as suggested by the name, is the sporadic formation of horns or raised areas in an orange color that resemble rust on plant surfaces. These spores are the fungi responsible for the spread of infection. Rust infections may be fatal to trees, according to the University of Minnesota Extension. Natural control of rust tree diseases includes removing and destroying infected plant parts without causing further damage or creating wounds on the trees. For severely infected trees, removal is suggested, according to the University of Minnesota Extension. Always keep pruning tools sanitized between each cut and from one plant to the next to inhibit disease transfer. For chemical control, certain fungicides may be of assistance. 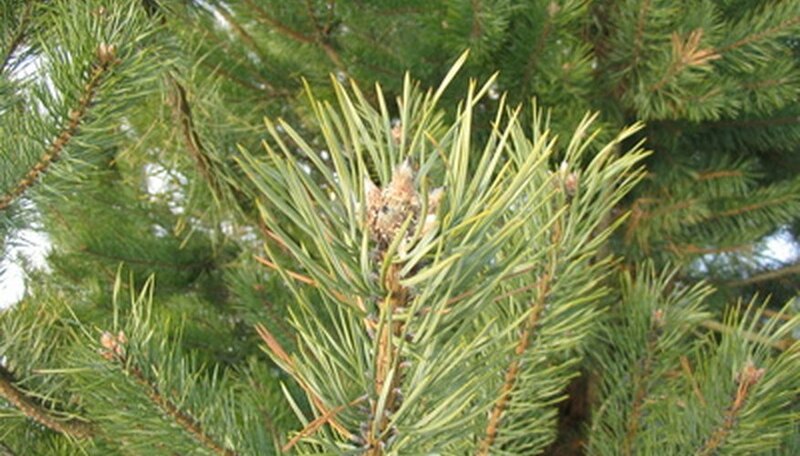 Though fungicides are not recommended for pine rusts, certain preventive fungicides may be able to stop a problem before it starts for cedar rusts. When the cedar tree displays the orange rust symptoms, apply a fungicide to the other host tree (an apple or pear tree, for example, in your landscape) at intervals of 10 days to two weeks between each application until rust disappears from the cedar tree, according to the University of Minnesota Extension. Choose mancozeb, chlorothalonil or other fungicides labeled for prevention of cedar rust.